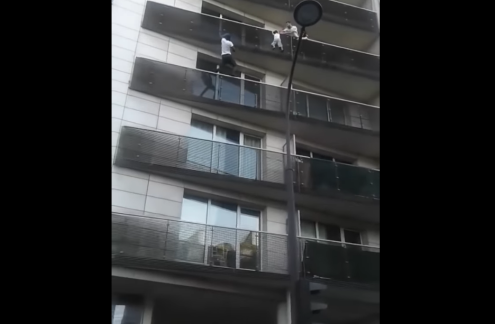 A young man has been hailed a hero after he scaled a Paris building to save a four-year-old child hanging from a fourth-floor balcony. Mamoudou Gassama took just seconds to reach the child in a spectacular rescue viewed millions of times on social networks, the Guardian reports. Gassama met with French President Emmanuel Macron at the Elysée Palace. On meeting with Gassama, Macron said: "With Mr. Gamassa who saved the life of a child in climbing 4 stories with his bare hands on Saturday. I told him that in recognition of this heroic act he was going to be regulated as soon as possible and that the fire brigade of Paris was ready to welcome him. I also invited him to apply for naturalization." Local authorities quoted by French media said the child's parents were not at home at the time. Malian 'Spiderman' Mamoudou Gassama saves child in France. On meeting with Gassama, Macron said: "With Mr. Gassama who saved the life of a child in climbing 4 stories with his bare hands on Saturday. I told him that in recognition of this heroic act he was going to be regulated as soon as possible and that the fire brigade of Paris was ready to welcome him. I also invited him to apply for naturalization." 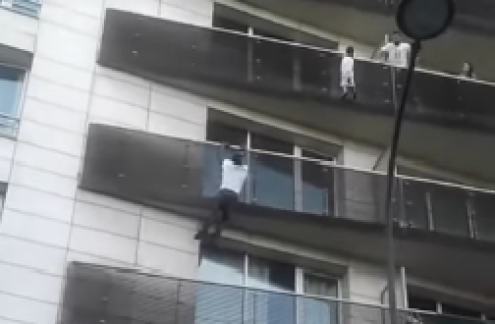 A screenshot from the video showing a man - a Malian migrant in Paris - climbing up a building to rescue a child.